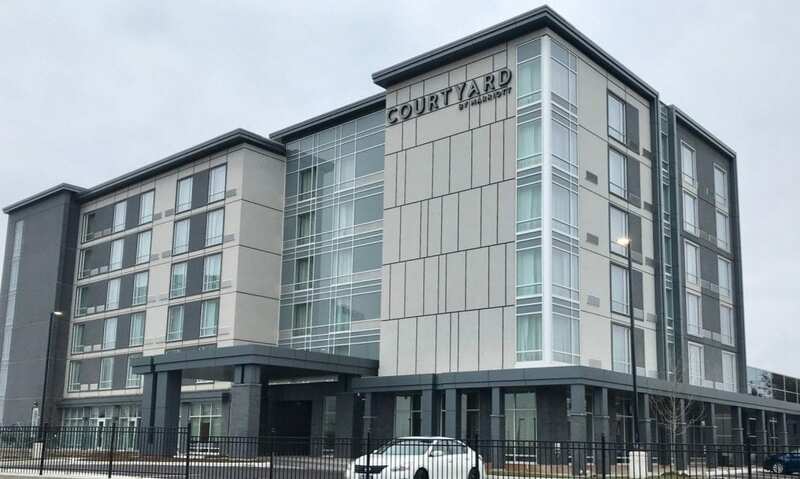 Adjacent to the Burlington Convention Centre, the Courtyard Burlington is located 40 minutes from downtown Toronto and offers guests convenient access Canada’s Wonderland, Niagara Falls, Burlington Botanical Gardens and the scenic waterfalls of Hamilton. Rates begin at $169 per night. The Courtyard Burlington features the brand’s latest lobby design, where guests can enjoy an open and modern environment outside of their rooms. The newly designed Bistro is the epicenter of the lobby, which fosters social connections and collaboration with more flexible and informal seating options. The Bistro offers guests a wide variety of “made to order” breakfast, lunch and dinner items, “grab and go” options, and also features an array of specialty cocktails, beer and wine for guests to unwind at the end of the day. The construction of the hotel was developed by TriAxis Construction Limited, a well-respected construction management firm with over 25 years of experience and expertise in the industry. “As Development and Construction Manager for the hotel, our professional and committed team has ensured that every aspect of the hotel was built to the highest quality and with utmost attention to detail, to meet or exceed the highest standards set by Marriott,” said Domenic Fuda, President of TriAxis Construction Limited and an equity partner in Burlington Hotels Group Inc.
“With this exciting Courtyard by Marriott project, we will be offering one of the world’s leading hotel brands to the Burlington, Oakville and QEW corridor, consisting of upscale facilities, impeccable accommodations, excellent culinary experiences, and professional and friendly service with a European flair,” said Sandra Stewart-Fearnside, General Manager. “We are very proud to be the first to bring the very successful Courtyard by Marriott brand to the Burlington/Oakville area and to finally meet the extraordinary demand for a first-rate hotel next to the Burlington Convention Centre,” said Jack Moreira, Owner of Burlington Convention Centre. Throughout the hotel, guests can connect with ample electrical outlets. The business library features a separate computer stations dedicated solely to printing airline boarding passes and checking flight status. Green has been Courtyard’s signature color since Marriott launched the brand 30 years ago. Now it is even greener with the introduction of a guest recycling program for the environment. Receptacles for paper, glass, plastic and metal are conveniently located by side exits. The six-story hotel features a heated indoor saltwater pool, a fitness centre and guest laundry, and offers 1,800 square feet of meeting space to accommodate functions of up to 120 people. The hotel is adjacent by a heated and covered walkway to the Burlington Convention Centre that features an additional 20,000 square feet of flexible meeting space accommodating up to 1,200 guests. Courtyard by Marriott offers a refreshing environment that helps guests stay connected, productive and balanced. In Paris another Courtyard by Marriott opened bringing new design to the French Capital.